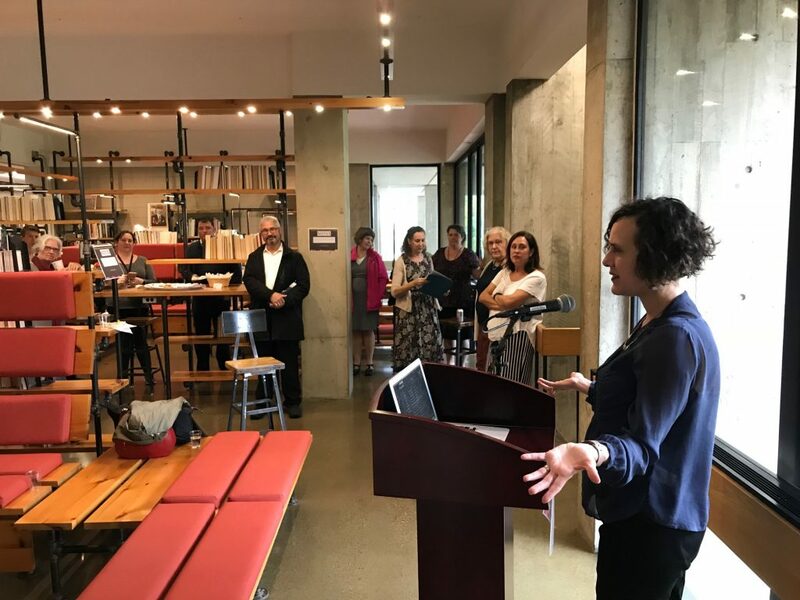 On Tuesday, October 2, we celebrated Jennifer Gunter King and thanked her for her more than six years of wonderful leadership in the Harold F. Johnson Library. Jennifer’s last day was on Friday, and she is now headed to Georgia to oversee the Stuart A. Rose Manuscripts, Archives, and Rare Book Library at Emory University. We will miss her dearly! Below are some of my excerpted remarks from her reception. 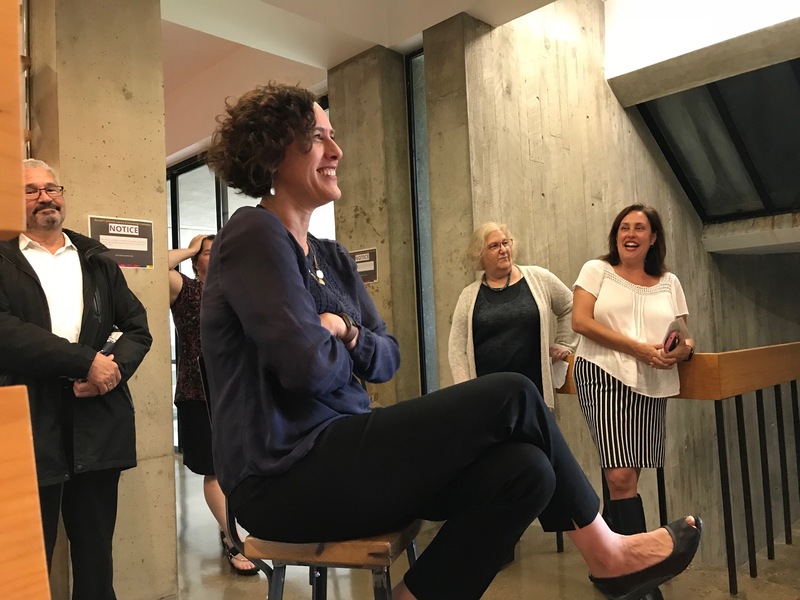 Departing Library Director Jennifer King at her farewell reception. Jennifer turned out to be the perfect person to first go back to this document, and secondly, to actually transform our library. I still remember her presentation at her interview, when she used a lot of hand gestures about bringing all services together into one cohesive center. And then shortly after she got here, her enthusiasm in expressing that, while we were a good library, we needed to be a, and I’m quoting Jennifer here, a “kickass” library. And, indeed, in her 6 and a half years here, that has all come to fruition: Jennifer got herself invited to the college’s administrative meetings, she helped make this Seydel Reading Room a reality, and, of course, she got us the Mellon grant that has transformed the main floor of the library into the Knowledge Commons, thereby bringing academic support services together into the library space. Jennifer has always made the rest of us so very tired, the rest of us who may only have 3 or zero kids, or no dog, or just one chicken, or only 3 cats, and no bunny…. just watching her work so hard, each day full of new energy and ideas. Jennifer, thank you so much for bringing such transformation and grace to this now kickass library! *excerpt of poem Sangha by Danna Faulds, published in her book Go In and In, 2002. One Response to "Farewell to Jennifer Gunter King"
Creative lines 🙂 We miss you, Jennifer!